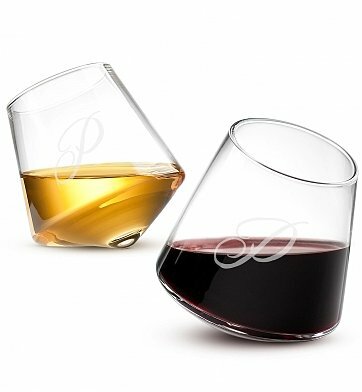 The shape of a wine glass plays an important role in preserving the integrity of fine wine, and the innovative design of these award-winning angled glasses elicit the best flavors from your favorite wine. Each Italian wine glass is made with a wide bowl and angled sides for optimal oxygenation, and once the glass is set on the table, it safely swirls in place, intensifying the aromas as they dissolve into their surroundings. Two angled Italian crystal wine glasses. Option to add an engraved initial to each glass. Gift arrives presentation-ready, placed in our elegant signature gift box. A complimentary card with your personal greeting or message is included with your gift. Personalize it! Complete the personalization option and we'll engrave a single initial on each glass. Choose identical or individual initial for each glass - enter the information to be monogrammed during the checkout phase of the ordering process. Each glass measures 4" x 4". if ordered by 9:00 pm EDT Sunday April 21st. Personalized Angled Glass Set is a hand delivered gift. These gifts are delivered by one of our local design centers located throughout the United States and Canada. Same day delivery is available for most gifts when ordered before the cutoff time. The cutoff time for Personalized Angled Glass Set is in the recipient's time zone. 100% lead-free high quality sustainable Italian crystal. Optional personalization - add an initial to each glass. Arrives presentation-ready in an elegant signature gift box. Great gift idea for the wine drinker. The glasses are unusual and different with an added touch of class with the ingraving of an initial letter. My aunt and uncle loved them. This particular item is packaged so beautifully and safely. And I can't say enough about the quick turn around from the time I placed my order to the moment it was delivered. I will be ordering more from GiftTree in the future. My clients loved the gift, I knew it was a perfect choice. This is going to be a gift for a young couple's celebration. The couple enjoy their wine and love unusual wine glasses and I am sure they will love these. I did open the box and thought the glasses were amazing and fun. I saw these at a craft show. The person I was with noticed my interest and got me a pair for my birthday. They were as fun to use and drink from as to look at so I ordered another pair to have a set of 4. They're elegant, fun and great wine glasses. I live in California, but I ordered this product for my sister-in-law who lives in Houston, TX. She is thoroughly pleased with it, and if my favorite sister-in-law is satisfied with ANYTHING, I would certainly recommend it. I sent these to my friends... best gift of the year!! Unique design, for the true wine lover. Loved these glasses I received for my birthday. As a huge wine lover I'm using these glasses all the time!